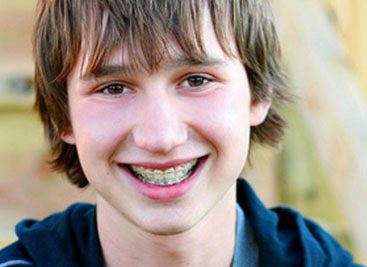 Patient started treatment at age eleven and wore braces for 26 months. He loves his new smile. This patient’s lateral incisors were congenitally missing. She had braces for 20 months to move the teeth into the correct position, then the missing teeth were replaced with bonded “Maryland” bridges. Patient’s underbite was causing her jaw joint discomfort and excessive wear patterns on her teeth. After 30 months of treatment starting at age 32, she now finds smiling and chewing much easier. At age 10, patient had a big overbite with the top teeth protruding beyond the bottom. She had two phases of treatment. The first helped her jaws to grow more harmoniously and the second aligned her teeth and bite. At age 13, she was proudly displaying her new smile. Patient’s parents were concerned about both aesthetics and the health of the erupting permanent teeth when they brought him to the orthodontist at age eight. The lower front teeth were crowded and they touched the palate, and the upper front teeth were extremely displaced from their normal positions. After 20 months of Phase I treatment with an expander and partial braces, patient’s appearance and dental function were vastly improved. There are many reasons to seek orthodontic work on your teeth. On this page, you can see a series of before and after photos of some of the more common reasons people come to us. 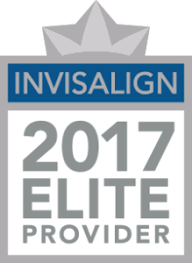 We treat all types of alignment issues with traditional braces, Invisalign, among other treatments. Dr. Miller has been treating patients for over 20 years with great results. The first common reason people seek orthodontic treatment is overcrowding of teeth. You may have inherited your father’s narrow mouth but your mother’s large teeth and so there is nowhere for them to go except to overlap. This can give your smile an awkward look, it’s true, but it can also create other problems too, like difficulty cleaning them and contributes to irregular wear on the teeth as well. Overbites and underbites are two reasons easily recognizable reasons to see an orthodontist as well. They are so common that everyone knows what they look like. Either the top bite extends too far over the lower bite or the reverse, the lower bite extends considerably in front of the lower bite. To envision these bites, think of Freddy Mercury for the overbite and Bruce Springsteen for the underbite. These types of bites can interfere with chewing action, and put excess strain on the jaw, causing pain. These are only a few of the reasons people seek orthodontic treatment. If you would like to straighten your teeth for a healthier bite and a straighter smile, call for a consultation.